Warsaw (VNA) – A requiem has been held at Thien Phuc Pagoda in the Polish capital of Warsaw to commemorate soldiers who laid down their lives to defend Vietnam’s sovereignty. The service took place on July 24 on the threshold of the 69th War Invalids and Martyrs Day (July 27, 1947). The Vietnam Buddhist Association in Poland and expatriates expressed their gratitude to the martyrs through Buddhist rituals such as offering incense and flowers and lighting lanterns. At the event, the participants also voiced their support for The Hague tribunal’s ruling on the Philippines’ lawsuit against China’s unfounded territorial claims within the so-called “nine-dash line” in the East Sea. They believe that the verdict provides an important legal foundation for resolving disputes in the waters. 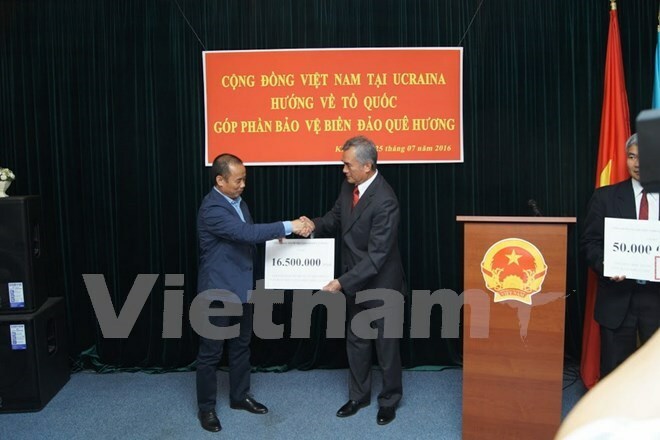 On July 25, the Vietnamese Embassy in Ukraine organised a ceremony to receive donations to the construction of a memorial site to the 64 soldiers killed while protecting Gac Ma (Johnson South) Reef in Vietnam’s Truong Sa (Spratly) archipelago on March 14, 1988. Addressing the embassy staff and representatives of Vietnamese associations in Ukraine, Ambassador Nguyen Minh Tri said the site, located in the central province of Khanh Hoa, aims to serve as a venue for the martyrs’ relatives and people nationwide to pay homage to the deceased. It will also help instill patriotism in younger generations. The embassy raised 164 million VND (7,350 USD) at the event, and the sum will be sent to Vietnam’s authorised agencies as soon as possible.